One hundred thirty-four million. That's how much money was spent on 4th of July bacon in 2017 - and that’s just for barbeques. 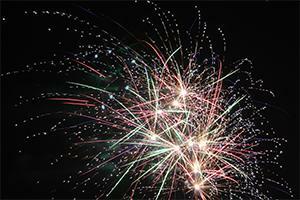 What about fireworks, the holiday’s most celebrated pastime? $900 million is the predicted revenue for the 2018 fireworks season, according to a spokesperson from the American Pyrotechnics Association. From meat sales to Roman candles, there are plenty of numbers in play for the Fourth, but it's hard to gauge exactly what the holiday means for the economy of the nation's capital, specifically. "We've never been asked that. There's really no comprehensive information available about the economic impact of July 4th on the District," said a spokesperson for the DC Business Improvement District. …but, to give you an idea of what’s projected — and what’s come before — here are some notable highlights. DC area businesses have a lot in store for them this week, after all. ● Expect around 150 million hot dogs to be consumed in total. And around $1.5 billion in beer and wine! ● $7.5 billion was spent by a record 22 million visitors to the District in 2017 — and even more anticipated this year, according to Elliot L. Ferguson, President and CEO of Destination DC. ● And, according to AAA, nearly 47 million people will travel more than 50 miles this Independence day — a five percent increase over last year. "Major events throughout the year, like July 4, positively impact the local economy, and we expect to see a boost from visitors staying in hotels, eating in restaurants and enjoying all there is to do in the nation’s capital,” says Ferguson. And throughout the entire nation. As America gears up for its 243rd birthday, so do US businesses. At American University’s Kogod School of Business, we’re staying tuned for what’s to come.